Research has shown that vitamin D levels above 40 ng/ml (100 nmol/L) are safe AND beneficial to pregnancy and early childhood. So, it is interesting to note that most women of childbearing age are below that level, and virtually all African American women of childbearing age are below the recommended level. NHANES is the National Health and Nutrition Examination Survey, a program run by the Centers for Disease Control (CDC) to assess health and nutrition status of Americans. They started collecting vitamin D serum levels in 1988. 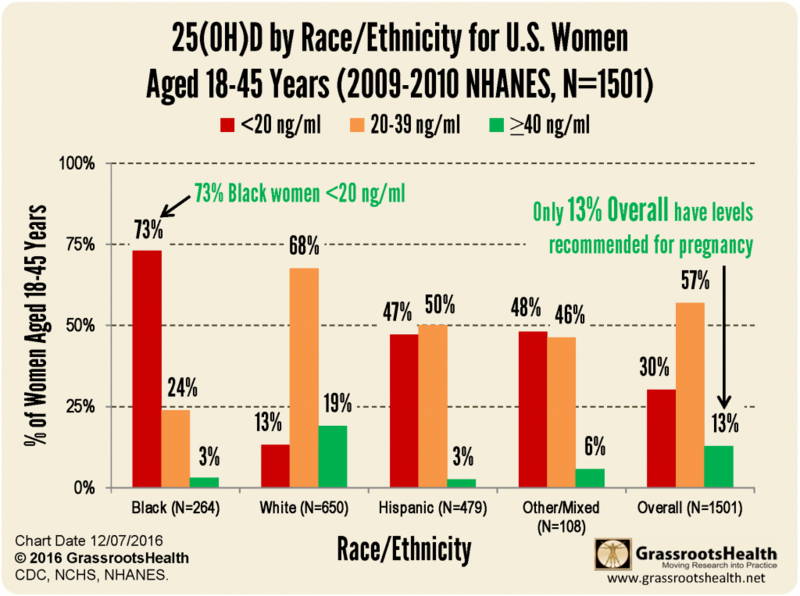 Chart showing 25(OH)D by race/ethnicity for U.S. women aged 18-45 years (2005-2006 NHANES, N=1479).